*Before undertaking this daunting project, Carla Peterson was aware of precious little about her roots. In fact, although she’s African-American, the only 19th Century ancestor she really knew anything about was a Caucasian great-grandfather from Haiti named Philip Augustus White (1823-1891). But despite that lack of genealogical information, Peterson, a Professor of English at the University of Maryland, embarked on a fruitful quest which began in the manuscript room at the famed Schomburg Center for Research. 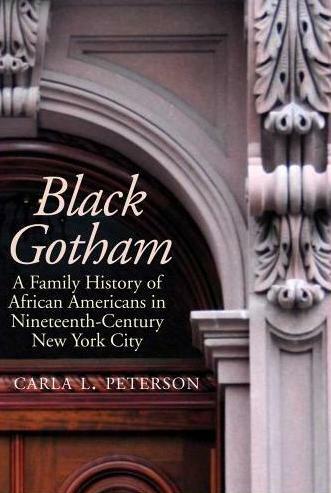 And the upshot of her tireless efforts is Black Gotham: A Family History of African-Americans in 19th Century New York City. Among the surprising data unearthed by the author in the course of her study was that she had descended from New York City’s black upper class, a cosmopolitan community comprised not only of doctors, businessmen and other professionals but of writers, artists and musicians, too. This information flies in the face of the conventional wisdom which would suggest that the Harlem Renaissance of the 1920s and 1930s represented the first flowering of black culture in the city. While Professor’s Peterson’s family tree certainly proves fascinating, what makes her seminal opus so significant is how she painstakingly reconstructs her forefathers’ past in light of the overall African-American struggle for emancipation and equality in the 1800s. Thus, we learn here about the collective, New York City black lobby for everything from abolition to quality education to the right to vote to the protection of fugitive slaves. A shameful legacy which makes Carla Peterson’s overdue tribute to her intrepid ancestors an invaluable addition to the annals of African-American literature.